I watch very little television. However, during the fall, I watch some football (both types) and this means I, by default, have to watch TV advertising. As a direct response copywriter, I watch the branding ads and laugh … but for all the wrong (or right) reasons. On major networks, the ads are the usual pulp … entertaining branding ads with no call to action and, thus, no accountability. Expensive media placement. Expensive production. I won’t bang on about how big ad agencies do business (ripping you off) and I won’t mention how branding people view advertising (as a way to deceive clients into placing huge media) and I’ll avoid the subject of 95% of corporate marketing directors (who NEVER want to be accountable and hide behind social media and their branding agency), and I certainly don’t want to mention ROI (in the company of branding people) but a couple of ads currently running for big brands make fun of direct response TV ads. In a Geico ad, the Tasmanian Devil rips through a direct response TV ad for plates. How this relates to car insurance is a bit beyond me but, after all, I’m just a direct response copywriter. So what do I know? 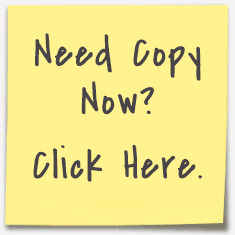 I write direct response copy that generates millions in sales. That’s all. And another insurance ad, for a company I can’t remember (ha! ), is running a semi-spoof of QVC. And QVC is a direct response medium. Oh how those creative directors must be guffawing when they create these ads. They’re certain to win prizes! They’re so creative! Oh you’re so very very funny! It’s a new level of creativity! We’ll link this to social media and it WILL go viral! The client will be so so happy! Sooner than you think, your party is over. TV is over and that’s your medium. Online advertising, according to every source, now attracts more money than “traditional” media and that means, get this, you can measure ROI. And your clients will now be asking you to, get this, if you’ll excuse the split infinitive, produce actual financial results. Return … on … investment. So while you might mock direct response, direct response copywriters, and direct response TV ads, we’re going to win. Or more saliently, the client is going to win … which is what really matters. If you continue to hang on to your branding MO, you’ll be out of work extremely soon. Your game is over. If I were you, I would make some time, and soon, to discover the fundamentals of direct response marketing. All of us will welcome you with open arms. This might shock branding types but direct response is collegial and welcoming. We’re all in this together. We’re all in this to help our clients make some money and build the value of the business. We happily share ideas to help each other grow. And spend some time with David Ogilvy, who actually loved direct response … as you’ll discover here. My thoughts about the tragedy in Paris. Here in the United States, there’s a reason the First Amendment is the first amendment. Free speech is the foundation of a free society. For the last 30 years, the merchants of political correctness have been trying to take away our free speech by telling us what we should say and what we shouldn’t. It's an attempt to control us and take away our freedoms. I wonder how the merchants of political correctness feel right now. I very much doubt they even get the connection.